Dinner with leader of Jegog! Bali Traditional Tour We hold a dinner party in honor of Mr Suwentra who is master of Balinese music. 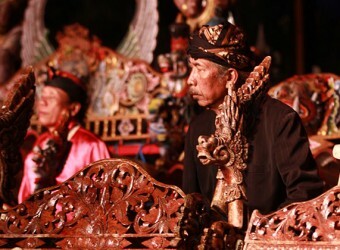 Mr Suwentra is one of the leader of Jegog. He restored a Jegog music through regular concert which has been crumbling away. In this dinner, You can hear interesting his story which history of Bali and Bali Hindu. Ofcourse about Jegog too. Also he can speak English well so you will have great time. For the dinner meal we will set up at Chinese restaurant Sky Room in Kuta. Please enjoy the tasty dinner too. Elegant Dancers Bina Remaja mean ‘leader of young’. They perform Legong dance made from old historical novel ‘Ramayana’.